Sue Vickerman was born in Bradford, has lived on four continents and currently resides in a lighthouse near Aberdeen. Her stories and poems have appeared in magazines (Orbis, Smiths Knoll, Staple, Mslexia, &c.) and in several anthologies (Virago, Diva Books, Diamond Twig). Her articles have appeared in The Guardian and The Times Educational Supplement. The Scottish Arts Council is supporting the completion of her novel Special Needs and a full length poetry collection due in September 2005 (Biscuit Publishing). 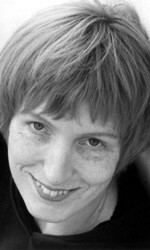 Sue was the winner of the 2003 Biscuit Publishing Poetry Prize. These poems are selected from The Social Decline of the Oystercatcher (Biscuit Publishing, 2005) and from Shag (Arrowhead Press, 2003).